Wrigley Oil Painting Co., Ltd. was established in 1991,is a set wholesale and export of hand painted oil painting production-oriented enterprises in China. There are more than 385 contracted excellent artists in my workshop. They are ready to serve you with a huge collection of 100% hand-painted oil painting designs. And that is why we gain a very high reputation among the circle from our customers around the world. 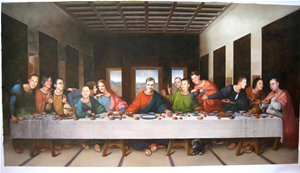 Best service and integrity is our motto, and all kinds of different style oilpaintings can be offered to our customers. Not only reproduction of the famous paintings but also unique custom-ordered oilpaintings can be found in our workshop. You can go through our website to check our online catalogue. Or you can also send us the email about which style you are favorite, we will make a special CD for you from our thousands of pictures in our database. Capturing the special moment and turning it into a masterpiece which will last forever. Our portrait artists will gladly create Hand-painted painting for your Portrait. It could be a perfect gift for your girlfriend, kids, family, wedding ceremony, birthday, graduation ceremony and so on. By a photograph, we can capture your bride's glow, your daughter's smile, your grandfather's eyes or even your beloved pet. Hand-painted portrait paintings are timeless gift of memories and love. It may take 20 days if you would like to own a copy of a Van Gogh, Monet, Klimt or any others’ artists’ masterpieces. 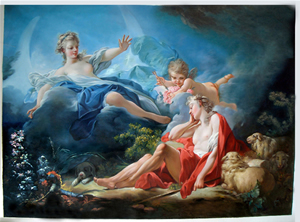 At Wrigley Oil Painting Co., Ltd, we can offer handmade reproductions of the most famous works. Besides our profession and our prices, customer service is also our advantage. We’ll work with you throughout the process to make sure that the painting you receive is exactly what you want. That’s a great way to impress friends, neighbors and clients alike by displaying museum quality art in your own living room or at your office. How about giving the Mona Lisa as a gift? Wrigley Oil Painting Co., Ltd makes it all possible. We can photograph the customer to head an historical paintings, can be a portrait of the latest original painting, we call such oil painting is a portrait style of “Nikas Safronov”. About the custom oil paintings, we always take the customer’s demand as the center, we innovate unceasingly and improve the oil painting quality, and we will respect and understand the client's ideas and opinions fully. Our artists have skilled painting skills and mature painting style to make sure the quality of the oil paintings which we produced often exceed customer expectations. We have a number of creative artists who are university professors with unique creativity. Some of their oil paintings are collected by foreign collectors and art museums. For The original oil painting, you only need to tell us your ideas and creativity, or you give us an example of the picture or photo, we will be able to give you perfect original oil paintings. All of oil paintings are guaranteed to be finished by hand. Our artists don't use any type of computer, projector device or printer. We also collect some oil painting pictures from the very popular American painter's works. These American painters are Andy Warhol (1928-1987), John Singer Sargent (1856-1925), Roy Lichtenstein (1923-1997),Thomas kinkade， William Whitaker. We can duplicate any works from them. And we really hope you can choose your favorite painting here. The one of our catalogue is oil painting reproductions and painting styles on canvas. The other catalogue is oil painting masterpieces on canvas, sorted by the famous artists and works. What's more, all designs showing online can be painted on board. Our traditional areas requested by the production of various types of high-quality customer exquisite hand painted oil paintings, the hand painted oil paintings are pure products from hand-painted. 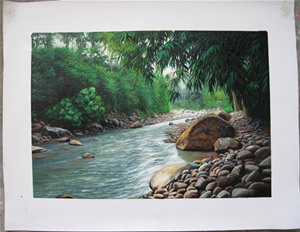 Our artists have over seventy years of experience on the oil painting. Some of our artists have a specific area of expertise - for example, we have some artist to concentrate on each kind of portraits. Once you submit a photograph, we'll choose the artist who is the best suited for your specific picture. Each of our paintings is produced by using the finest paints and the highest quality canvas, which can make your hand-painted portrait painting look better and last forever. If you aren't completely satisfied with your portrait, you don't pay a dime. We have the cheapest price and best quality hand-painting portrait to satisfy our customers. It is very convenient for u to email any kinds of the pictures to us for our reference. We have a team of customer service agents dedicated to answering any question you may have. After you place an order, an agent will constantly contact with you until you receive your hand-painted painting. E-mail:info@oilpaintingplant.com.And tell us the detail about painting. We will do our best effort to do your every painting. We believed deeply that you will love our oil paintings.